15 things you didn’t know about gold. Is gold edible, why rose gold is rose and who sets its price in the world? If any of these questions got you curious, Magpie, this means that this article is just for you. What’s more, after reading it you’ll be a Magpie smarter with 15 things you didn’t know about gold. Let’s start reading. Do you know why gold is considered king of the metals? The term “king of the metals” gold has obtained due to its color and uniqueness in nature. Yes, Magpie, because most metals are gray or silver and white, and gold is shiny and bright yellow. Alloy is a metal material obtained by melting two or more metals. Well, a complicated process. So maybe, Magpie, think about the gold magic in action which turns yellow gold into rose, white or blue one. How do we get various colors of gold? Gold is a chameleon among metals. Rose color is obtained from alloy with palladium and addition of zinc. White gold is alloy with palladium, zinc, silver, copper, nickel, and blue gold is the recent years (1994) invention, gold with iron and other metals (usually the manufacturer’s secret). In gold trade the basic measurement unit is troy ounce. Ounce is 31.1 g. Troy ounce name doesn’t come from Troy, but from Troyes, town in North-East France – important trade center for gold in Middle Ages. Who sets the price of gold in the world? The price of gold on world markets is set at London Gold Fixing. It is set up by the largest institutions trading this metal on the stock market in New York, London, Zurich, Hong Kong and Sydney. Currently these are: Scotia Mocatta, Barclays Capital, Deutsche Bank, HSBC and Société Générale. The first London Gold Fixing took place on 12 September 1919. How much gold has been excavated in the world and where is it stored? Some claim that 160 thousand tons were mined, others say it was 2.5 million tons. So why so big divergence? 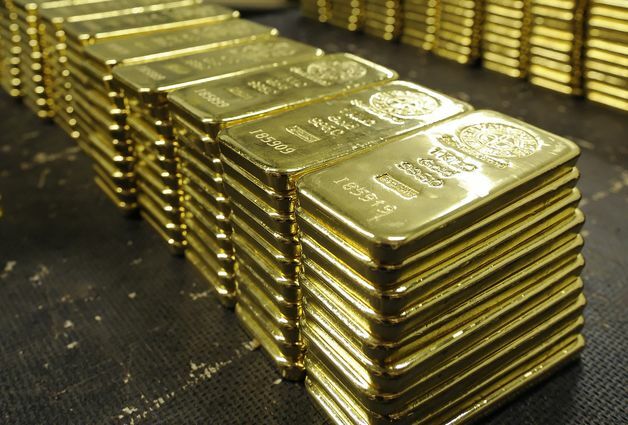 In many markets, gold is traded in non-physical form – paper gold. These are gold-based funds that do not have physical coverage. That is why, Magpie, it is assumed that the actual mined amount of gold is 3,300 tons. Gold is held in central banks in various countries, e.g. in the United States (8 thousand tons), in Germany (3.5 thousand tons) or in China (2 thousand tons), and so on. In this ranking there is also Poland with about 100 tons of gold. Who owns the largest gold deposits? Republic of South Africa, Russia, Chile, Canada… And here Magpie, I will surprise you – you couldn’t be more wrong. Most of this precious ore holds… Mother Nature. It is estimated that at the bottom of the oceans there may be up to 10 billion tons of gold. What does the word nugget mean? Nuggets are simply gold lumps that have been smoothed and rounded by water, usually the size of fruit pits, but there are also those that weigh more than 50 kilograms (found in South Africa, Congo, California and the Urals). However, the record was broken in 1872 by Holterman from Australia weighing 235 kg and measuring 1.42 meter. Remember, Magpies, that the nuggets excavated in this form are rare rarities. Reason? Only about 2% of gold excavated in the world are nuggets. Venetian ducat. Since 1284, for several centuries, it was the most popular payment medium in the world, especially in Europe. The ducat was 3.55 grams of gold, it was the purest gold that could be produced at that time. We can read about the famous ducat in Shakespeare’s “Romeo and Juliet” and in “The Merchant of Venice”. Can every Magpie test gold’s authenticity? Yes, by putting a magnet to it. This metal has no magnetic properties, so the item shouldn’t move. Gold is diamangetic, which meas it doesn’t react to magnet. Yes, it is a luxury good known since the 15th century, when the gold flakes were being added to liquors. GOLDWASSER is a known herbal and root liquor whose characteristic feature are tiny flakes of 22-23-carat gold, which are suspended in this alcohol. It is manufactured in Gdansk. There are other alcoholic beverages containing gold flakes and their price is several thousand dollars. Gold flakes and gold dust are now used as decoration in food and drinks as well as in cosmetics and medicine. Are Magpies made of gold? Yes, there is gold in our bones and blood. Is Buddha in Wat Traimit temple made of gold? The answer is: it is! In addition, it is the most expensive object of religious cult. It is made of fine gold, weights 5.5 tons and is worth about 50 million dollars. The custom of pasting thin flakes of fine gold by the believers changes Buddha’s appearance and worth. In the Old Testament gold is the most often mentioned metal – 570 times. The descriptions emphasize the wealth of the kings of Israel. It was also believed that owning gold was a proof of unusual grace and blessing from God. Gold is mentioned when Jesus is born, when Noah’s arc is built and at around the ten commandments. Magpies, I recommend diving into the world of golden legends. Gold has always provoked extreme emotions. Legends show how great power this ore has, how desired it was throughout the ages. Currently nothing has changed in that matter. It still awakens the appetites of treasure seekers but also of ordinary people like for example the inhabitants of Lower Silesia. In my opinion the most interesting evidence of love for gold you will find, dear Magpie, in the myth of King Midas and in the Argonaut expedition for the Golden Fleece. I also recommend you, Magpie, the Platonic legend of Atlantis, which is a mythical continent flowing with gold and diamonds. Amazing mysterious ore, beautiful and surprising, isn’t it? I will tell you that I fell in love immediately when I came across the first nugget in my grandfather’s goldsmith’s shop. Gold color, unexpected weight, nice in shape and shine – a pesky feeling. I held in my hands of the “king of the metals” which immediately took me in its fairy world. My dream is to arrange an expedition in search of gold, dig out my own nuggets. I want to be a treasure hunter like Indiana Jones, find a lost city…. How it’s going to be, Magpie, are you going with me?